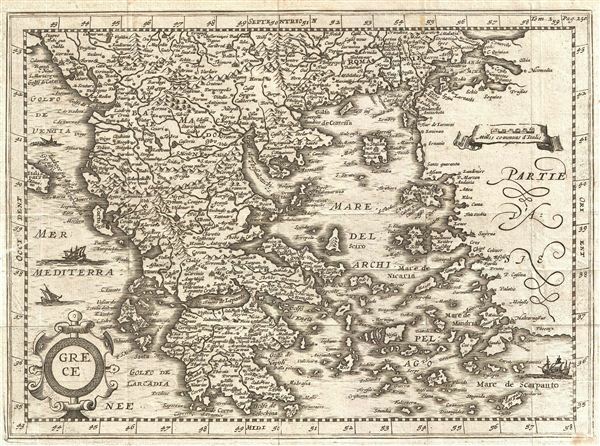 An uncommon early map of Greece issued for Martineau du Plessis in 1700. Centered on the Negroponte, this map covers from the Gulf of Venice to Asia Minor and From Romania and the Sea of Marmara to Morea. Beautifully details the many island and cities of Greece with three decorative sailing ships in the waters. Though most likely first drawn in the early 17th century, this edition was published with the 1700 edition of Martineau du Plessis' Nouvelle Geographie. Very good. Closed verso repair extending approximatly 1/2 inch from left center margin. Original fold lines. Blank on verso.